It's been a few months since Ferrari recalled its 458 Italia to fix a defect that led to the vehicles catching fire. 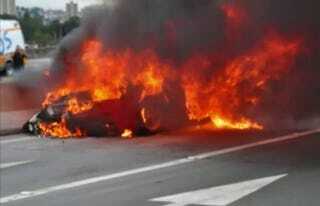 Which is why there's fresh interest after a purportedly "fixed" 458 caught fire in Sao Paolo, Brazil. The fire Saturday appeared to mimic the four other fires reported earlier this year. Ferrari announced in September it would stop using a heat shield adhesive that was causing the fires, and replace the cars that burned. Wrecked Exotics has a few more shots of the fire and the running list of 458s lost to fires or driver error.